Craftastical! : It's been a long time. . .
Anyways, enough of that. 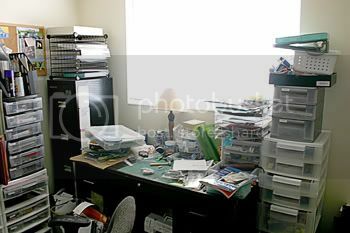 I thought it might be fun to post some photos of my scrap space. I have a great storage system, although I don't utilize it nearly enough. See how there's not even room to put a layout down on my desk. Yeah, need to clean it. 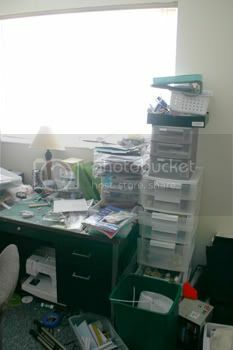 This is my storage for paper and embellishments. Anything alphbet is in one of the Iris containers. Then the two towers on the bottom are embellishments sorted by color. Love this system, although I have way too much blue stuff. Need to get rid of some of it. I also need to get rid of a bunch of paper--it's taking over! 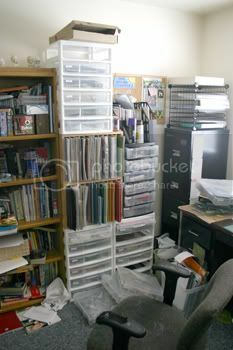 The top tower is projects, photos, mini album supplies and page kits. The towers on the other side of my desk. They have things like pencils, punches, adhesives, paints, that sort of thing. And yes, I do need that big of a trash can. It gets full quite often. I took the photos over by the computer desk. So, I've been scrapping like a crazy woman. All my stuff is posted at 2peas (also some of my HOF entry--eventually it will all be up). Here's a link if you want to check it out. Been doing a lot of digital lately.